Continuous charcoal retort idea - Charcoal Gasification - Drive On Wood! I think I’ll share all my ideas from now on… Maybe get out of that proprietary mindset. Use wood chips, wood chunks or biomass pellets as feedstock. Because of the stack effect, the pyrolysis gasses and steam, would exit the die and be sucked through the hot bed of coals. Possible dirty gasification? More efficient? The chimney could be replaced with a heat exchanger system to capture BTUs. We use 100:1 worm gear reducers with a DC Motor running at 48 volts off of a step up module. The motors run at 1700 rpms so the auger turns at 17 rpms and will twist into knot if it gets jammed good enough. Not to sidetrack you but have you thought of just modifying the Imbert with an automated grate shaker? I think if you detuned the jetting and then opened up the restriction and grate, you could generate char very rapidly. But it would be dependant on a specific fuel, chips vs pellets. Another idea is to eliminate the grate and use an auger like you have to but it would be horizontal feed out. I think the yield differences in a dedicated charcoal retort vs an imbert gasifier would be fairly significant. This is why All Power Labs had a different version of their GEK that was used for biochar production—BEK. That being said, an imbert might be a good choice if viewed from a financial aspect… i.e. it might be good enough, especially if you already own an imbert gasifier. 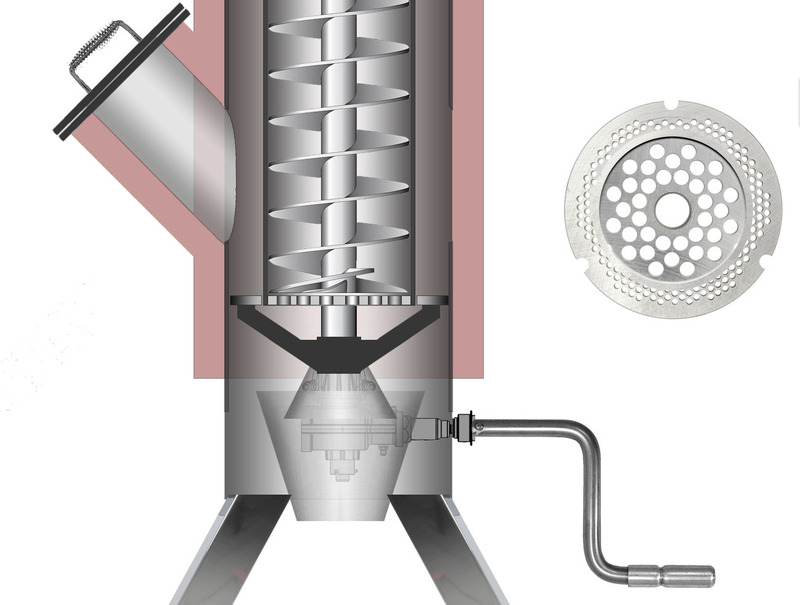 A charcoal retort with a dedicated heat exchanger is a very interesting proposition. This was why I believe in charcoal gasification so much. The basic premise being that we simply split gasification into two groups… drying / pyrolysis happens in the retort, and oxidation / reduction happen in the gasifier… This versatility lends itself well to market opportunities. I personally hated tar so much that it drove me towards the dark side… I was thrilled to never, ever have to deal with it again… And, in my experience, the performance with gasification was more consistent with charcoal vs biomass (especially on start up). So, if the dedicated retort can be specialized for heat capture, AND is superior in char production, to me, I feel like I’m on the right path. With all this being said, there is the “hassle” factor with char… And for many, this is a turn off. i get it… It’s all good. I can’t do links right now but check out alex English system for Burts greenhouses. It uses chips into a furnace through a horizontal belt and out the other side. According to you what size of wood chip passes through this equipment? Maybe a slight vertical vibration of the screw will help? I’d say anything under 1 inch would work well… The thicker the feedstock, the longer residence time needed for pyrolysis. I like to run charcoal at 1/8" (the size of rice krispies) all the way to 1/2". So for us charcoal guys—and biochar people—smaller feedstock is ideal. Your concept of horned continuously fascinates me. I wonder about the need for screw-without-end! biomass fragments (<1 ") should flow naturally in a large smooth vertical pipe? I fear that the screw consumes a lot of energy unnecessarily! Moreover this screw complicates the construction of the horned. Nice design, did anyone actually build and test one yet? I would like to build something like this. 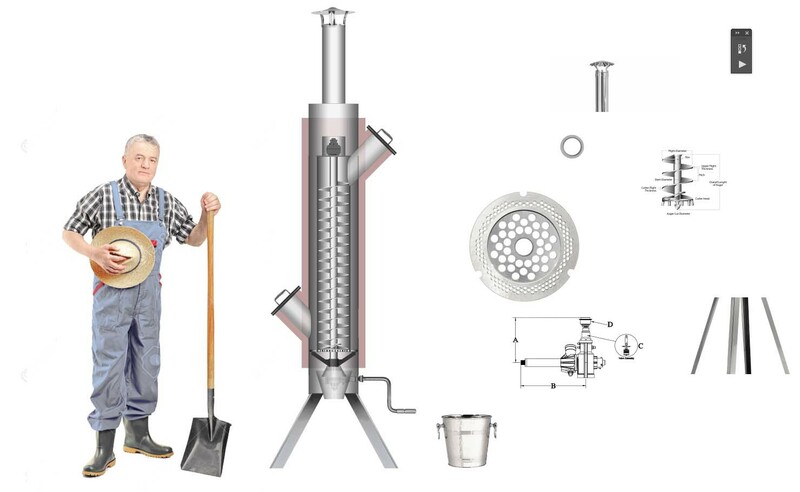 Small scale and continuous for carbonization of dry toilet waste mixed with fine wood chips. I’m used to seeing a burner under the feeding auger chamber that is fueled by the pyrolysis gases coming from the main reactor vessel. On this setup I see what might be a fan on top of the right hand stack. Is that fan pulling in air that passes through the cooler into the top of the main vessel where it combusts the gas?